Aphasia is a language disorder that is caused by damage to the brain, most often as a result of a stroke. Individuals with aphasia have trouble expressing themselves because they struggle with one or more of the following skills: reading, writing, listening, speaking, and/or comprehending. There are six different kinds of aphasia and every person with aphasia is unique. Some people have mild aphasia where they can speak but cannot form proper sentences, while others have a more severe aphasia and may say very little or nothing at all. Can someone with aphasia get better? The most important thing to remember about aphasia is to have hope because, unlike many other disorders, people with aphasia can improve. Research shows with regular practice and determination, people with aphasia can regain some of their language skills and reconnect with their family, friends, and communities. How can I get involved and raise awareness? Lingraphica and its partners are uniting together in a multi-channel campaign called Faces of Aphasia. 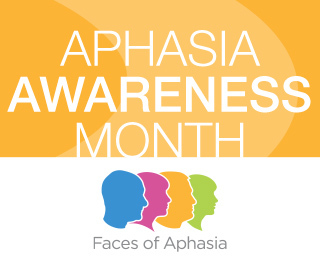 This campaign was created to spread awareness about aphasia and the faces impacted by it. If you have aphasia, care for someone with aphasia, or treat patients with aphasia, we want to hear from you! Go to facesofaphasia.com and submit your photo and story to be featured, then share it with your friends and family to spread awareness. Don’t forget to check out Lingraphica’s Facebook and Twitter pages throughout the month of June to find facts and figures about aphasia. Finally, to learn more about aphasia, download our new e-book, “What to Expect When You’re Not Expecting Aphasia” today!